I had an interesting discussion about Sametime earlier this week after I told someone I had been doing trainings all week to users about the new Sametime Meetings options they get with Sametime Standard. The other person didn’t think much of Sametime but asking through it turned out he really didn’t know what it had to offer either. 1. The option to have participants record the meeting themselves. This saves a lot on large data files having to be shared later on as well as stress for the presenter about having to think about it. 2. 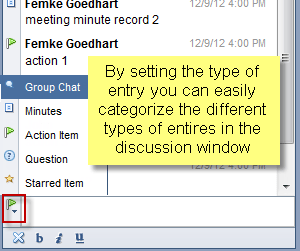 The option to set specific types of entries in the side chat. This way input gets categorized as you go and you can filter what types of updates you want to see by selecting the view options and selecting the appropriate filter. By getting questions being asked through the “Questions” option and setting the filter to show ‘questions only’ a presenter can easily keep track of what questions are being asked and by whom and address them without being distracted by other chatting or note taking going on. 3. 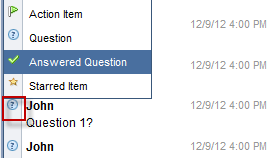 Which brings me to the next feature: the option to mark an item in the discussion list as a “starred item” to draw attention to it or as an “answered” question. Both the participant as well as presenter have the ability to do this by simply clicking the icon in front of the entry and changing it to the appropriate option. This allows for easy management of still open issues and questions as well as categorizing. all communication going on in the Discussion side window by type so already categorized into “Meeting minutes”, “actions”, etc. any recordings made by any of the participants. So all in all I really like the Sametime Standard meeting options. The above are just a few, there are more, like the polling option but these really set it apart for me. And it can be used both on-premises as well as in the cloud. The new meeting functionality is fully enabled on the IBM Smartcloud environment and can be tried there for free for 60 days. After that a stand alone web meetings account will cost you $5 a month and allows you to set up meetings that can host up to 200 participants. Similar options on either GoTo meeting or WebEx will cost you 10 times as much at least. Ok granted, you will get some additional features with those services that Sametime doesn’t offer but the question is: do you really need those or will they just confuse your users? I think Sametime really is a great option for a lot of us there and definitely worth a look! Ephox EditLive pimping the richtext editor in IBM Connections: Hello spell check! Do you know that if you set a Sametime meeting room as “online meeting” in Lotus Notes meetings it will be removed when you delegate the meeting?